Herpetology (from Greek: ἑρπετόν, herpeton, "creeping animal" and λόγος, logos, "knowledge") is the branch of zoology dealing with the study of reptiles and amphibians. The study of reptiles and amphibians reveals humanity's strong and lasting curiosity about nature. Since the dawn of humanity, humans have studied reptiles and amphibians, if only as a source of food or because of the dangers of toxins or venoms. Herpetology not only offers many practical benefits—medicinal applications, conservation, environmental indicators, model organisms, and so forth—but also addresses people's desire to better understand the world around them. Herpetology is concerned with poikilothermic, or cold-blooded, tetrapods (four-legged vertebrates). "Herps" include reptiles like lizards, snakes, crocodiles, and turtles, and amphibians like frogs, toads, salamanders, newts, waterdogs, mudpuppies, sirens, and caecilians. Herpetology is concerned with the study of such extant taxa and even extinct taxa. Reptiles and amphibians share poikilothermy, and sometimes a superficial resemblance to one another (e.g. salamanders and lizards are often confused), but these two groups are quite distinct. The essential difference is that amphibians include all tetrapods that do not have amniotic eggs, while reptiles are tetrapods and amniotes (animals whose embryos are surrounded by an amniotic membrane that encases it in amniotic fluid). There are many other differences. For example, amphibians tend to have permeable skin that allows for the exchange of gases, are often bound to water for at least part of their lives, have glandular skin, and many of them produce toxic secretions in some of their skin glands, warding off predators and generally tasting bad. Reptiles, by contrast, typically have a dry watertight skin, usually protected by scales, that normally has few if any glands. Many species of reptiles spend no part of their lives anywhere near water, and they all have lungs. Living reptilians usually, if not always, lay eggs or give birth on land, including marine turtles, which only come ashore for this purpose. Again, extinct creatures may have exhibited some differences. Despite these differences between amphibians and reptiles, they form a common focus under the umbrella of herpetology. Furthermore, despite the differences between these two groups and fish (non-tetrapod vertebrates), it also is not uncommon for herpetological and ichthyological (study of fish) scientific societies to "team up," publishing joint journals and holding joint conferences in order to foster the exchange of ideas between the fields One of the most prestigious herpetology societies is an example of this: the American Society for Ichthyology and Herpetology. The interest in herpetology is ancient, with observations being made by Aristotle and even references in the first book of the Bible. Discussions of reptiles and amphibians can be found in early Egyptian religions, Shamanism, and religions in pre-Colombian Americas, where the Quetezecoatly was the serpent that was the law giver and culture bearer. Because reptiles and amphibians offer important economic, ecological, aesthetic, and medicinal values, herpetology offers numerous benefits to humanity. For example, amphibians are often very sensitive to environmental changes, offering a visible warning to humans that significant changes are taking place. Some toxins and venoms produced by reptiles and amphibians are useful in human medicine. Currently, some snake venom has been used to create anti-coagulants that work to treat stroke victims and heart attack cases. Medicine produced from amphibians now are used to treat heart aliments, bacterial infections, skin and colon cancers, depression, and chronic pain, among others. Amphibian toxins continue to be studied by herpetologists for possible applications. For example, a poison frog from South America (Epipedobates tricolor) secretes a non-addictive painkiller 200 times more potent than morphine, offering promise in this area if the toxicity can be neutralized. Reptiles and amphibians are a critical element in the food chains of most ecosystems, and sometimes a keystone species whose removal can drastically alter the populations of other organisms. The consumption by reptiles and amphibians of rodents and insect pests aid in control of these animals, which can be serious agricultural pests; furthermore, reducing the numbers of insects can lower the prevalence of insect-borne diseases. Thus, studies aimed at maintaining the balance of nature are important. The skin of crocodilians, snakes, and lizards are used in leather goods, such as shoes, handbags, gloves, and belts, and thus study of these animals can offer direct economic applications. Some reptiles likewise present threats to people, whether because they are venomous, like some snakes, or can attack humans, such as some crocodilians, or their skin harbors salmonella, a bacterial disease, and thus their study aids in preventing such dangers. Some reptiles and amphibians are model organisms for research study. 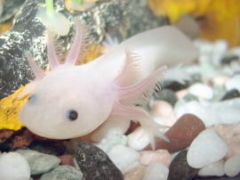 Axolotls, for example, are used extensively in scientific research into such areas as regeneration ability, heart defects, and vertebral development. Their ability to regenerate most body parts, ease of breeding, and large embryos are main reasons for their applicability as a model organism for research. People with an avid interest in herpetology and who keep different reptiles or amphibians, often refer to themselves as "herpers." There are many careers in the field of herpetology. These included, but are not limited to, field researcher, public or private breeder, zoological staff or curator, college professor, and museum staff or curator. Those wishing to pursue a career in herpetology must have a strong science and math background. Few universities offer this program, and thus it is a highly competitive field. In modern academic science, it is rare for individuals to consider themselves a herpetologist first and foremost. Most individuals focus on a particular field such as ecology, evolution, taxonomy, physiology, or molecular biology, and within that field ask questions pertaining to or best answered by examining reptiles and amphibians. For example, an evolutionary biologist who is also a herpetologist may choose to work on how warning coloration evolved in coral snakes. Adler, K. (ed.). 1989. Contributions to the History of Herpetology. Oxford, OH: S.S.A.R. ISBN 0916984192. Lescure, J., and P. David. 2007. The birth and infancy of herpetology. Part 1. From Aristotle to Linnaeus. Bibliotheca Herpetologica 7(1): 7-11. Myers, C. W. 2000. A history of herpetology at the American Museum of Natural History. Bulletin of the American Museum of Natural History 252(1): 1-232. This page was last modified on 22 December 2017, at 20:17.